No Greater Pain tells the story of mothers coming to terms with the grief of losing a child to violence. The pain that these mothers feel has left them with concerns for their well being, concern for their future as mothers and at times doubts with their faith. 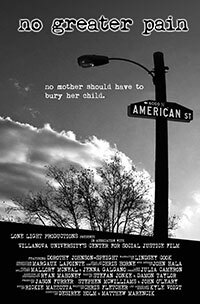 The documentary explores how one mother, Dorothy Johnson-Speight, lost a son to senseless violence and summoned up the courage to build a community of women to fight the violence within Philadelphia.